Home theaters are a rising trend among homeowners who like entertaining guests and family members with movie marathons and Netflix binges. Most would fill the room with sofas and another assortment of chairs and seats, but only a few appreciate the value and elegance that recliner chairs, like the Bonzy Recliner Chair, can bring. Recliner chairs, especially leather ones, bring a certain level of comfort and class in any room, while its features and functionalities are ideal for an entertainment room or any space where you entertain guests. The way recliner seats can be tilted makes it great for watching movies on TV and projector screens, while cup holders and side pockets let you stock up on snacks and reading materials for a day-long marathon. While some would argue that recliners tend to consume a lot of space, wall huggers like the Bonzy recliner consume half as much as what usually is needed for a full-recliner. This means you can pack several wall huggers in a neat column without having to worry about someone reclining too much and eating up the floor space of the one behind them. This recliner chair has a large seating dimension at 20-1/2″ width x 21-1/4″ diameter x 19″ height, roomy enough for anyone to fit. The backrest and cushions are thick and comfortable to sit on, while the arm and leg rests are padded with the same material as well. The backrest of this chair reclines in two settings, one at 110 degrees and another at 145 degrees, perfect enough to prevent any stiffness during marathons and series bingeing. The upholstery of this recliner chair is made of stain-resistant PU leather which is both durable and beautiful at the same time. This kind of leather is also easy to clean and does not stain easily. It is also more eco-friendly than other types of leather and is more breathable. The hardwood frame fits through any sized door, and the whole aperture can be assembled within a few minutes. 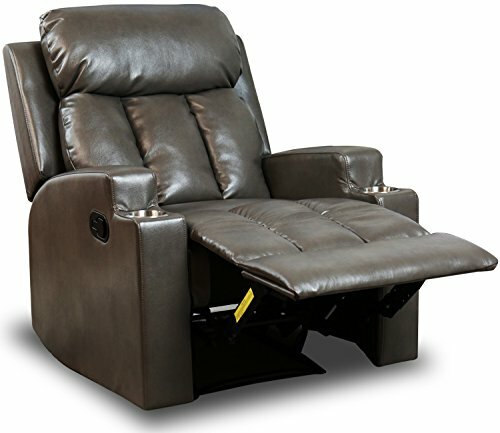 No special tool is needed to have a full built recliner chair in minutes after delivery. A simple latch located on the sides of this chair can lift both the leg rest and recline the backrest to provide optimum relaxation. It is also embedded into the frame, so it is not a cause for obstruction, allowing for minimal clearances between the chair and another piece of furniture, like another Bonzy chair. The hardwood frame is made of high-quality LVL which is better than steel. This kind of frame is also near invisible because of the upholstery and cushion, while all the nailheads and screws are trimmed and hidden. The Bonzy chair has one cup holder on both armrests for additional drinking options, for those days where one drink is not enough or when you want to share the chair with someone special. The Bonzy Recliner Chair is a wall-hugging recliner that consumes less space than full recliners, yet it can still give the same kind of tilt for optimal viewing pleasure. The way that the backrest and the leg support stretch out also makes it easier to get out during those bathroom emergencies. The framing materials used to create this furniture are made of laminated veneer lumber which is reinforced with metal, making it even stronger while maintaining its easy-to-assemble nature. This reclining chair can sit up to 300 lbs and can even entertain multiple kids at once. The oversized dimensions and the all-around cushion complete the relaxing vibe that this contemporary piece of furniture brings to any space in any home. The relaxing comfort that the Bonzy Recliner Chair has is comparable to that of the Divano Roma Furniture Bonded Leather Rocker Recliner. The Divano Roma Furniture Recliner Chair is an ultra plush chair that features bonded leather upholstery on a hardwood frame. This recliner chair also has an oversized designed and overstuffed cushions to deliver that comfort most recliner seats are known for. It comes with a side lever that instantly gives you the angle that you need for great viewing pleasure or angle for that quick nap. The durable upholstery and frame are designed to withstand any great weight and can last for a long period. Its brown leather color makes it a modern contemporary piece of furniture that can blend well with other pieces within the same room. While both the Bonzy Recliner Chair and the Divano Roma Furniture Recliner Chair share the same oversized dimensions surrounded by thick and comfortable cushions, there can only be one winner in our comparison, and that is the Bonzy. First off, the Bonzy requires less space than the Divano Roma, since the latter is a fully reclining chair more apt for a living room, which makes the former more versatile when it comes to furniture placement. The metal reinforcements and large seating capacity make the Bonzy chair the better choice, while it’s Luxe Leather Gel Upholstery is also better than bonded leather of the Divano Roma as it is easier to maintain and clean. The materials used for the Bonzy are also more ecologically viable and friendly. Another feature that puts the Bonzy chair up front is its cup holders which the Divano Roma Furniture Chair lacks because of its cushion armrests. The lever of the Divano Roma can also cause minor accidents especially if caught in a pant leg or if a child steps on it, while the latch of the Bonzy is kept out of sight and melds into the background. Recliner chairs add a certain level of elegance, and its often contemporary modern appearance compliments any room no matter if it is for entertaining guests or private use. More importantly, recliner chairs offer more than just comfort; it also lends a sense of fulfillment when you see among other pieces of furniture that you have carefully selected to complete your entertainment area set up.